Article first published as Classic Tea Sandwiches on Blogcritics. 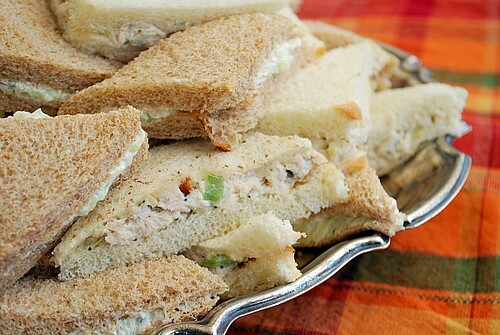 There are quite a few kinds of tea sandwich fillings but by far, the most popular are cucumber and chicken salad. The tea cucumbers are so easy to prepare and healthy too! As for the chicken salad, I like a hint of curry for some flavor and a touch of color. These recipes came from What's Cooking America - a great site full of information. Place cucumber slices between layers of paper towels to remove excess moisture. In a small bowl, combine butter and watercress; spread on one side of each slice of bread. Lay cucumber slices onto the buttered side of eight (8) slices of bread. Sprinkle the cucumbers with salt. Cover each with 1 tablespoon alfalfa sprouts, if using, and top with the remaining slices of bread, buttered side down. Carefully cut the crusts from each sandwich with a long, sharp knife after the sandwiches are filled. Cut the sandwiches in half diagonally and then cut in half again. If desired, decorative shapes can be made with cookie cutters. Yields 8 whole sandwiches or 16 halves or 32 fourths. In a large bowl, combine chicken, nuts, celery, salt, and mayonnaise; stir until well blended. Add curry powder or paste. Spread one side of each piece of bread lightly with butter. Top the buttered side of 8 slices of bread with some of the chicken mixture and top with the remaining bread slices, buttered side down. Carefully cut the crusts from each sandwich with a long, sharp knife. Cut the sandwiches in half diagonally and then cut in half again. Yum I love tea sandwiches! They are always the perfect thing to do when the girls come over. Perfect spring recipe. I have to admit, I rarely make sandwiches at home but everytime I see cute tea sandwiches, I always wonder why since I'm a sucker for anything en minature. My daughter wants to have a "lords and ladies luncheon" for her birthday party in June. I think if I cut these out in the shapes of cars and butterfly, the 6 year olds just might eat them.